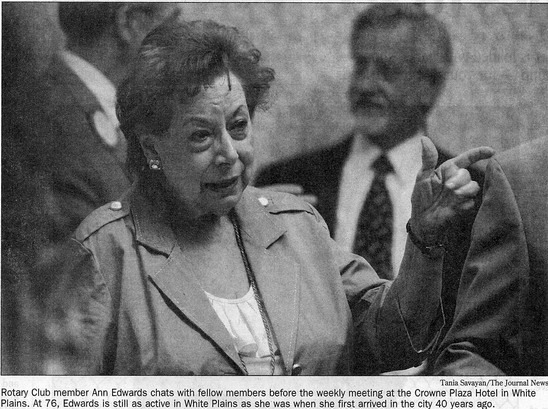 It would be difficult to do much of anything in White Plains without seeing Ann Edwards' fingerprints. If you visit the local hospital, volunteer for a charity, admire the sculptures that dot the city or even watch your child play in a school park, you owe a piece of your experience to Edwards. Through her leadership of nearly a dozen charities and other groups over four decades, the longtime White Plains resident has touched nearly every aspect of life in the city. "I always felt the urge to get involved," said Edwards, 76, who has served as vice president of the White Plains Board of Education and is a past president of several groups, including the United Way of Greater White Plains, the White Plains Beautification Foundation and the Auxiliary of White Plains Hospital Center. "It's a privilege to be able to donate my time to this city. I'm happy with what I've accomplished." Edwards' service was honored last week by The Rotary Club of White Plains, through which she has helped raise thousands of dollars for college scholarships. The Rotary plans to fund, in Edwards' name, a pediatric care station in White Plains Hospital's emergency room. A plaque bearing Edwards name will be hung there, said Josephine Falcone, a member of the Rotary and friend of Edwards. "She's been instrumental in so many things," Falcone said. "Volunteerism to Ann, it's her life's work. She just goes where she think she's needed. She's an incredible individual." The honor at the hospital is a fitting tribute, since it's there Edwards began her volunteer efforts 40 years ago. In 1967, Edwards and her husband, Robert, moved from Brooklyn to White Plains. She enrolled her children at Highlands Elementary School — at the time an elementary program in what is now the middle school — where she met Mary Marano, another parent. That chance encounter began a lifelong friendship. "Before you knew it, she had taken me under her wing," Edwards said of Marano. Marano, a member of the auxiliary at White Plains Hospital, introduced Edwards to the group, whose members volunteer and raise money for the hospital. Edwards joined the auxiliary, eventually becoming president, and also became active in the Highlands School Parent Teacher Assocation. She became president of the White Plains PTA Council before making a successful run in 1983 for the Board of Education, where she served for four years. Edwards still serves as chairwoman of the Joint Facilities Committee, a city-school district partnership. Edwards' résumé also includes a stint as president of the board of trustees of United Way of Greater White Plains, a unit of the United Way of Westchester and Putnam. She also served as vice president of the parent group's board. The White Plains sculpture committee, which Edwards helped form about eight years ago, has placed artwork throughout the city. But Edwards said she's most proud of her work in education, including as a founding member of the Foundation for Public Education in White Plains, which raises money for arts and other programs in city schools. As with all of her volunteer efforts, Edwards is still active with the Auxiliary of White Plains Hospital. Since 1991, she has also served on the hospital's board of directors. "I seem to stay with the organizations forever. I get out of one and I get two more," Edwards said with a chuckle. "But I enjoy doing it. I got so much out of it, so much more than I've given."